Lifeboats from Girvan and Troon braved freezing driving rain this week to assist a fishing vessel with a net caught around its propeller. A launch request was made by Belfast Coastguard for the launch of Girvan Lifeboat at 2.05pm on Wednesday 14 January. 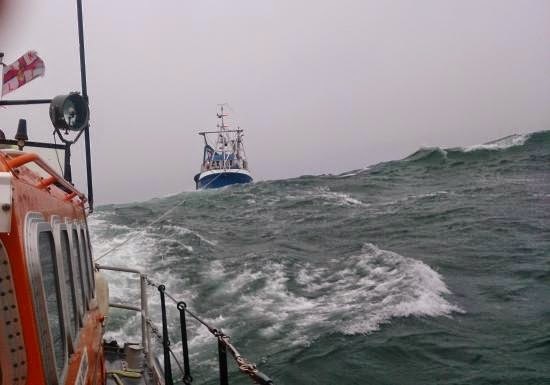 With freezing, driving rain & Force 8 south-westerly gale force winds, Girvan Lifeboat RNLB Sylvia Burrell and her volunteer crew made their way north to the 15m fishing vessel MFV Spes Bona. It was reported that Spes Bona was approx. 1.5 miles west of Turnberry Point and its fishing equipment had become entangled in the propeller. Troon lifeboat RNLB Jim Moffat and its volunteer crew were also tasked to attend. On arrival at the scene, with conditions worsening, Girvan Lifeboat established a tow line to the stricken vessel, where shortly after the net was cut away. It was determined due to conditions, tide and size of the fishing vessel that the boat would be towed to Troon Harbour. Once near Heads Of Ayr, the tow was transferred to Troon lifeboat, with Girvan Lifeboat relocating to the stern of the fishing boat, where a line was attached allowing Girvan Lifeboat to be utilised as a drogue, allowing better control of the fishing vessel in the weather conditions. At 6.30pm both lifeboats and the fishing vessel arrived safely at Troon Harbour, where the vessel was securely berthed. With conditions worsening by the minute, Girvan lifeboat started the return journey to Girvan, heading on into the storm. At 9.30pm Girvan lifeboat and its volunteer crew returned to station, where the boat was cleaned, refuelled and made ready for service. The Royal National Lifeboat Institution is the charity that saves lives at sea. Volunteers provide a 24-hour search and rescue service in the United Kingdom and Republic of Ireland from 236 lifeboat stations, including four along the River Thames and inland lifeboat stations at Loch Ness, Lough Derg, Enniskillen and Lough Ree. Additionally the RNLI has more than 1,000 lifeguards on over 180 beaches around the UK and operates a specialist flood rescue team, which can respond anywhere across the UK and Ireland when inland flooding puts lives at risk. The RNLI relies on public donations and legacies to maintain its rescue service. As a charity it is separate from, but works alongside, government-controlled and funded coastguard services. Since the RNLI was founded in 1824 its lifeboat crews and lifeguards have saved at least 140,000 lives. Volunteers make up 95% of the charity, including 4,600 volunteer lifeboat crew members and 3,000 volunteer shore crew. Additionally, tens of thousands of other dedicated volunteers raise funds and awareness, give safety advice, and help in RNLI museums, shops and offices.